80"L x 55"W, Weighs 2.4 lbs. The Striped Blanket from Yoga Accessories enhances any home or professional yoga space. Totally machine washable (cold cycle/low heat), this strong little blanket has a loose weave, and folds nice and evenly to support your yoga practice. Yoga blankets are a functional yoga prop — moldable to any shape, they will also keep you nice and warm in meditation. This blanket is well put together and is long enough to use in various positions. I was really pleased with this blanket! It is well, made, I love the colors, and is a great size (large). Light yet with a tight weave, this is great for a cover, or as a bolster. I am very happy I bought one! 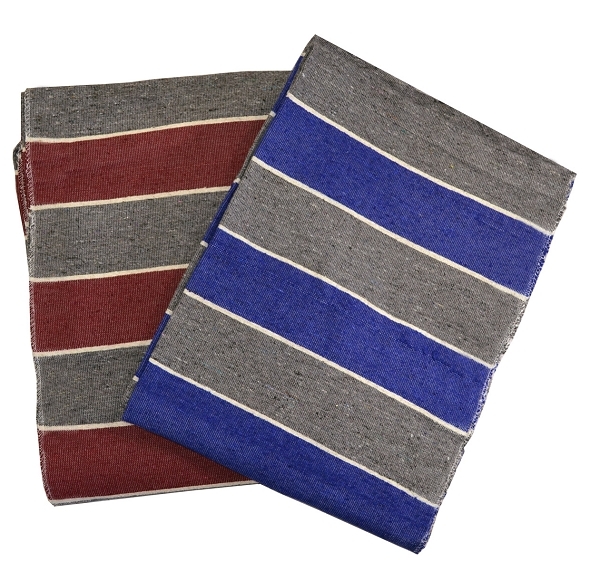 These relatively light weight blankets are great if you need to transport blankets from one class location to another. Folded and stacked, they are a perfect prop to elevate beginning students in seated poses and pranyanmma . Pretty and large, but by no means super soft, nor soft. Even after a wash this thin blanket felt scratchy. Guess I will stick to pure cotton next time. I am returning this item.